Surely by now the oft repeated denigration that American composer George Antheil began his career as the Bad Boy of Music is best forgotten and attention fully paid to his accomplishments as a composer of remarkable highly-charged neo-romantic music and film scores (for the latter, see footnote below). These two symphonies, that hopefully are the first recordings in a new Chandos series, will maybe further establish Antheil as a composer well worthy of consideration. This follows earlier releases of his music, especially on the CPO and Naxos labels and various others, including an interesting Cala album that compares recordings of Antheil’s and Vaughan Williams’s Fourth Symphonies conducted by Leopold Stokowski. Antheil’s Fourth Symphony ‘1942’ was heard first in a radio broadcast by the NBC Symphony Orchestra under Stokowski in February 1944. Critics and concert-goers considered it to be a hit; Time magazine even trumpeting, “…an almost unprecedented phenomenon: a new American symphony which ‘failed to bore its audience’. Well the audience could hardly have slept through the brutal, grinding music of the opening movement that Antheil described as suggesting ‘the tense and troubled state of mind’ as the entire future of the world hung in the balance’. The opening movement’s atmospheric music is very evocative of such sentiments; heavy march rhythms abounding, and fast- paced, headlong music threatening everything in its path. Much comment was made at the time of the influence of Shostakovich and especially of that composer’s Seventh Symphony ‘Leningrad’ but Antheil was quick to rebuke this, asserting that much of the material had been composed before Shostakovich had written any symphonies. The second movement is a meditation on mass executions of civilians by the Nazis in Lidice, Czechoslovakia and in Poland. Here the music is restless, sinuous, mysterious and mystic; folk-music-like and plaintive. The music is reminiscent of Richard Strauss and Bernard Herrmann. The third movement is a sardonic scherzo – a ‘brutal joke, the joke of war’ but with quieter reflective interlude. The work ends in jubilation as spirits are uplifted by the success of the Allied landings in North Africa in the November of 1942. George Antheil’s Symphony No. 5 represented the composer’s abandonment of ‘musical modernism’ in favour of melody and tonality. It is cast in three movements. He described his first movement as an impression of ‘the rather happy American music I hear about me daily’. Indeed it is sunny and with helter-skelter material sometimes sounding mechanical, and other times suggestive of the fairground – there is homespun romance too. The second movement is more elegiac and pastoral in character despite an occasional shadow: it reminds one of both Copland and Vaughan Williams. The finale is supposed to capture the ‘youthful, optimistic joy’ that is essentially the American characteristic and it is accordingly thrusting and brashly high spirited. 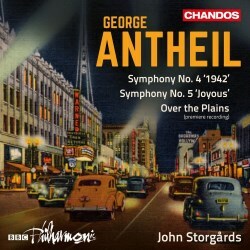 The recording also includes Antheil’s short atmospheric piece, Over the Plains. This is an exuberant and often whimsical view of the Old West with allusions to cowboys, and indians on the warpath. As the Founding Editor of Film Music on the Web (now defunct) I would like to make some comments on the film music of George Antheil (he composed scores for nearly 30 films) that has been largely ignored by the recording companies. Many film music fans will recall the splendid series of classic film scores recorded by Charles Gerhardt in the 1960s. I cannot recall the inclusion of one Antheil score even in the Music for the Films of Humphrey Bogart collection yet Antheil wrote the music for no less than four Bogart movies: Knock on Any Door (1949), Tokyo Joe (1949) In A Lonely Place (the celebrated film noire from1950) and Sirocco (1951). Perhaps it was felt that Antheil’s tough uncompromising music well suited Bogart’s characterisations? Antheil also wrote the score for two early Cecil B. DeMille films: The Plainsman (1936 - starring Gary Cooper) and The Buccaneer (1938). Amongst his other films are Spectre of the Rose (1946 – set in the world of ballet), The Pride and the Passion (with Cary Grant and Sophia Loren), and Dementia (a much lauded score for this 1955 film). The Pride and the Passion, based on C.S. Forester’s novel The Gun, is Antheil’s only movie score to have been commercially recorded (http://www.kritzerland.com/prideKings.htm). It is to be hoped that Chandos will include some Antheil film music in any future albums.